When should I start collecting yo-yos? How should I get started in yo-yo collecting? How do I decide what yo-yos to get? Where should I look for old yo-yos? What should I look for when buying a yo-yo? What sources of information are there that can help me with my yo-yo collection? Are there any reproductions available of old wooden yo-yos? What other yo-yo stuff is good to collect? What's the best way to find out about the latest yo-yo releases? What yo-yos do you think will be valuable in the future, that are still available now in the U.S.? What's the best way to keep track of a yo-yo collection? How do I grade a yo-yo? What is the best price guide to use for collectable yo-yos? I have some old yo-yos I want to sell. What's the best way to go about it? I want to show my collection of yo-yos but I'm not sure how I should do it. Any ideas? How should I store my yo-yo collection? Should an old yo-yo be repaired if it is damaged? Some of the yo-yos I have collected and kept in the package have batteries. Won't those batteries eventually get old and start to leak? I have some old yo-yos that still have the original string on it (or at least a string from the same period as the yo-yo I think). Should I remove the string? If I keep a yo-yo in its package, will it be worth more? Yo-yos are one of most widely available toys in the world. The toy transcends all ages. Collecting yo-yos can sharpen your observation skills and improve your ability to organize information. It's a fun way to learn about the science of physics and how different types of materials and shapes affect a yo-yo's performance. Learn more about the countries where foreign yo-yos are made and how children and adults play with the toy. Actually, if you are looking to yo-yos as a serious investment for the future, you probably should try something else. It's unlikely anyone has ever sold an entire yo-yo collection for profit. Still, a collection of yo-yos that you have carefully assembled and taken care of over the years, may later be sold for a profit. It's important to remember that you don't have to spend a lot of money to get started on a nice yo-yo collection. And, for the most part, it makes no difference where you live when it comes to availability; yo-yos are found in nearly every country on the planet and in a wide variety of price ranges. Now! Actually, the best time to collect yo-yos is when they are not as popular and no one is interested in them. That was not the case about late 1997 to 2001. During that time period, yo-yo sales, including collectible yo-yos, saw a rise in popularity (and price) due, in part, to the Internet. At that time, it seemed as if every kid was playing with a yo-yo! In this country, many people, both young and old, are enjoying the sport and collecting side right now. So, get started on your collection today! The first rule of collecting anything is that you should collect only those things that you truly enjoy and are interested in. Yo-yo collectors are curious and interested in learning more about the yo-yos they find, and in talking with other collectors about the history of a particular item. If you find yourself in the same boat, then you are headed in the right direction. You can get started in yo-yo collecting by first deciding on an area of focus. For example, you may decide to start collecting only ball bearing yo-yos, or just plastic yo-yos, or wooden yo-yos from a particular manufacturer. Or, you may decide to collect them all (in which case, you better have lots of money to spend!). Yo-yos that have none of this information on its halves--regardless of how exotic the yo-yo is or how beautiful--is worth very little. Therefore, get in the habit of collecting only yo-yos with a logo; they're much more interesting (and valuable). Consider focusing on yo-yos that are of interest to you and that you can afford. Avoid getting caught up in all the hype and talk that surrounds a new yo-yo before and after it is release. Try collecting the first editions of a model or unusual seconds (sometimes BC/What's Next has let some unusual yo-yos slip out into the market. For example, the author recently found a BC Phantom model with a one of a kind paint scheme and a Tom Kuhn RD-2 in a laminated rainbow configuration). When it comes to old yo-yos (usually pre-1970), it helps to study the market first to find out what is available and what people are paying for yo-yos that interest you. You can study the market by looking at the two collecting books mentioned in this FAQ and especially by following auctions of yo-yos on the Internet. By far the most popular place for finding old yo-yos are the auction sites found on the Internet. Be prepared, however, to pay substantially more for very old or rare yo-yos. Often, the price of rare yo-yos and yo-yo related items is much higher than the current values listed in yo-yo collecting books. On the other hand, if you are patient and can wait, you	can often find bargains. Yo-yo championships - a great meeting place for fellow collectors who have the same interest as you. Clean, sharp graphics on each yo-yo halve. Graphics colors should be rich and not faded (in comparison to other yo-yos of the same type). Centered graphics on the halves. No visible flaws on the yo-yo itself. No bent, opened, torn, or cracked packaging. Packages that do not have a store sticker or price sticker. No excessive scrapes on the outside diameter of each halve (indicating lots of "walking the dog"). Clear impressions of the logo or clean sharp graphics. Decals should be as whole as possible. If the yo-yo is jeweled, check for loose rhinestones. Repainting or shoddy repair work. Cook, Christopher. June, 1997. Collectible American Yo-Yos - 1920S-1970s : Historical Reference & Value Guide. ISBN: 0891457615. Meisenheimer, Lucky. April, 1999. Lucky's Collectors Guide to 20th Century Yo-Yos History and Values. ISBN: 0966761200. Cohen, Martin. December, 1971. "The Swinging World of Yo-Yos." Boys' Life. Malko, George. Summer, 1970. "Will There Ever Be Another Yo-Yo Champ?" Lithopinion. Volk, Daniel. June, 1992. "Collecting Yo-Yos." Antiques and Collecting. Zuckerman, Edward. July, 1985. "Quest for the Perfect Yo-Yo." Science Digest. eBay - Do a listings search on "yo-yo" to view many pictures (and accompanying detailed descriptions) of yo-yos that are often not found in yo-yo collecting books. The pictures are typically available for a limited time (usually 90 days or less). Yo-yo clubs that meet in your area. A store that sells a variety of yo-yos may be able to tell you if a club exists nearby. You can also check the American Yo-Yo Association (www.ayya.org) for a list of clubs in your area. Yes, there are several available, About 1994 or 1995 Dale Myrberg (a yo-yo Master from Utah) sent one of his mint condition Duncan Model "77" yo-yos to Brad Countryman, founder of What's Next/B.C. Yo-Yos. Brad used the yo-yo to recreate a reproduction of Duncan's most popular yo-yo. This model is still available today. The only difference between the old model and the "New" model is the location of the registered trademark symbol on the halve; it's now located to the right of the letter "n" in Duncan instead of above the word "Yo-Yo". Perhaps Duncan has also reproduced the Jeweled Tournament, Satellite in silver, wooden butterfly in silver, and the Imperial. All of these yo-yos are still available today (as of 2005). Perhaps some day, other well known favorites such as the Duncan Seattlite will also be reproduced (well, we can always wish and hope can't we?). On the Internet, visit Dave's Skill Toys web board and store. Many people post what they are finding in their part of the world. You can also use an Internet search engine to locate the web pages of yo-yo manufacturers for information about new releases. Currently (as of 2005), there are no widely distributed, mass published magazines devoted to the world of yo-yos and yo-yo playing. The best and most efficient way to keep track of a yo-yo collection is to use a database program. There are many database software titles available that can help you quickly create a custom database for yo-yo collecting. A database lets you organize the yo-yo information in many different ways, including printing custom reports or specifying queries. 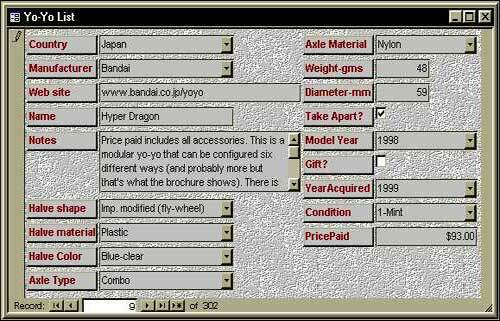 Occasionally, eBay has had a software program being auctioned that is specific to yo-yo collecting and included the ability to add pictures. Identifies where the yo-yo is sold or the country of origin. Identifies who made the yo-yo. Identifies the web site of the yo-yo or yo-yo maker. Identifies the name of the model of yo-yo (usually taken from the side of the yo-yo). List in detail the appearance of the yo-yo, unique qualities, where and when it was purchased. The text on the yo-yo packaging can help you write this part. Identifies the yo-yo shape such as standard, standard modified, concave, concave modified, or other (for example, the Holgate square yo-yo or the Damert Turbo Sparkler), and so forth. Identifies what the yo-yo is made out of such as polycarbonate, graphite, wood, plastic, aluminum, tin, and so forth. Identifies the colors of the yo-yo. Identifies the axle used in the yo-yo such as fixed, transaxle, ball bearing, roller bearing, a combination of these, or just unknown (if you have left it in the package). Identifies whether the axle is made of wood, nylon, metal, and so forth. Identifies the weight of the yo-yo, usually taken from the packaging, if it is listed. Nearly all Japanese yo-yos list this on their packaging. Identifies the diameter of the yo-yo, usually taken from the packaging. Nearly all Japanese yo-yos list this on their packaging. Can the yo-yo be taken apart for maintenance or to replace parts? What year was the yo-yo released? If you did not pay anything for the yo-yo you can check this box and leave the Price Paid field (listed below) empty or filled in if you know the retail value. What year did you purchase the yo-yo? Is the yo-yo in mint, excellent, good, fair, or poor condition? How much did you pay for the yo-yo (including tax or shipping)? The picture below is an example of one record in a yo-yo database that was created using the fields in the table above. You may want to add, delete, or edit fields of your own when you design your own database. The key is getting in the habit of updating the database as soon as you acquire a yo-yo. Because hard disk failures can occur unexpectedly, remember to create a back up of your yo-yo database on a separate disk using a program such as Norton Ghost 9 from	Symantec. If you do not have a computer, you can always write down the yo-yo information on separate index cards. You can grade a yo-yo by comparing the condition with the same yo-yo pictured in a yo-yo collecting guide or on an auction site on the Internet. Or, you can post a picture of your yo-yo on Dave's Skill Toys web site and solicit feedback. Grading by part-time collectors and amateurs is often a subjective process with many personal interpretations. If you think you have a valuable yo-yo, you may want to post a picture of it (along with a thorough description) on Dave's Skill Toys web site and solicit feedback from the yo-yo community. The two yo-yo collecting guides mentioned earlier in this FAQ are probably the best price guides today. Unfortunately, nearly all the prices in both guides do not reflect the prices that most collectors are paying today. Usually, the prices are significantly higher even for yo-yos in average, "played with" condition. You can thank the Internet for that. Still, the guides can serve as a starting point for pricing a yo-yo. Auction sites on the Internet are probably the best way to go about selling individual items. If you are selling a large collection (say 100 or more), you will not have very many bidders because few people have thousands of dollars at any given moment to spend all at once on a pile of yo-yos! In such case, you would be better off placing an ad in such a magazine as Yo-Yo Times. Consider displaying your collection in the childrens section of your public library. Chances are, they have some display cases that you could use. Pick a few prized yo-yos from your collection and write some interesting information about each yo-yo on a business size card. You can display the	card next to the yo-yo. Most libraries have several books about yo-yos too so you can point them to more information if they are interested. Just before you take down your display, you could give kids and adults a short program of some tricks you know and answer questions they may have about your collection. You can also become a Curator (it's free and easy) for the Museum of Yo-Yo History and add your own pictures of yo-yo memoribilia. The simplest and most economical way to store opened yo-yos or yo-yos in hard plastic packaging is in a hard-sided container such as a plastic box with a tight fitting lid. Store the box away from heat, sunlight, and moisture. The box should be able to hold a dozen or so yo-yos. Many yo-yo collections are stored in foam that has cut out circles for each yo-yo. Foam is typically considered a short-term storage solution because it often deteriorates and breaks down over time. If you are really ambitious and are looking for an attractive, long-term storage solution, you can make a wooden container with approximately 24 2.5" x 2.5 " boxes for each yo-yo, then cover it with glass to keep dust out. Yo-yos that are still in their cardboard packaging is a little more difficult to store. To keep the card flat, try storing them upright in a box. Or, a more costly method would be to buy comic bags and boards, put the yo-yo package inside it, and store it upright like a filing cabinet system. Stores that are going out of business can also be a good place to find inexpensive glass display cases or old watch display stands to house your collection. Generally, no. Any visible repair work you do to an old yo-yo will usually decrease its value. Therefore, you should decide if you want to maintain the yo-yo's quality or whether you want a fixed-up yo-yo that looks really nice. An exception to this may be when a halve on a wooden yo-yo becomes unglued from the axle (be careful though; many old wooden yo-yos were not originally glued at the axle such as the Whirl King). In such cases, it would be acceptable to glue it back together. The same is also true of jewels that fall out of jeweled yo-yos such as Duncan Jeweled Tournament yo-yos or Filipino Twirlers. A very small amount of epoxy applied to both surfaces will prevent the jewel from falling out again. Yes, that's a possibility. You would be better off carefully opening the package and removing the batteries from the yo-yo altogether. The loss from not having a mint in package (MIP) yo-yo would be much less than if the yo-yo was mint in package but damaged from a leaking battery. I have some old yo-yos that still have the original string on it (or at least a string from the same period as the yo-yo, I think). Should I remove the string? Old, worn, dirty, knotty strings that are still on old yo-yos do not make the yo-yo itself any more valuable. If you want, leave it on for esthetics. Or, you may want to consider replacing the old string with a "new" old string that comes from the same period and company as the yo-yo. Old strings packs occasionally appear on Internet auction sites. If you'd rather not go to all that work and expense, just take the old string off--carefully--and replace it with a new string that will age along with the yo-yo. If I keep a yo-yo in it's package, will it be worth more? Yo-yos (and even yo-yo string packs) in their original packaging is often considered by some collectors to be worth more. However, most packaging adds very little to the overall value of a yo-yo (some exceptions include the Playmaxx Cold Fusion can or a Tom Kuhn Heirloom set). Obviously, a yo-yo in it's original packaging will remain in mint condition. But, more importantly, original printed packaging provides additional information about the yo-yo such as where and when it was made, and details about how you take care of it, adjust it, and so forth. If you cannot keep the yo-yo in the package, at least try to keep the printed material. Factoid: Up until about 1988, Duncan made the "Mel-Yo-Dee." A nice collectors item now, it played the Duncan theme song when the yo-yo was spinning.